Ligers, wholphins and grolar bears, oh my! From the outside, the platypus looks like a grade-school art project assembled by a kid too busy making spitballs to pay attention in class. The creature, which is classified as a mammal, has a duck's bill and webbed feet, lays eggs like a reptile, but has fur and rears its young on milk. 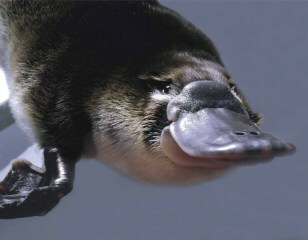 Researchers say the platypus genome is equally cobbled together from bird, reptile and mammalian lineages. One more oddity: Males can deliver venom from tiny spurs on each hind limb. Click on the "Next" arrow above to learn about nine more oddballs in the animal world. In April 2008, scientists in New Zealand looked a thawing colossal squid in the eye and discovered that the eye is, well, colossal — about the size of a dinner plate. That makes it the largest animal eye on Earth. Fishermen caught the 1,000-pound creature last year in Antarctic waters and froze it intact for scientific study. 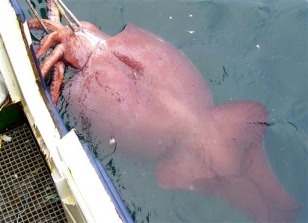 Colossal squids can reach 46 feet in length and have tentacles equipped with suckers and hooks. Scientists believe the creatures can descend to 6,500 feet and are active, aggressive hunters. 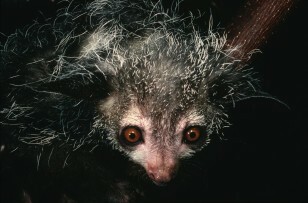 The aye-aye is a bushy-tailed primate from Madagascar with big eyes and bat ears. But call it funny-looking and it just might extend its extra-long middle finger in your general direction. The member of the lemur family otherwise uses the extended digit to fish out grubs from the crevices of trees. Captive aye-ayes such as the one shown here from Duke University are teaching scientists about the evolution of color vision. 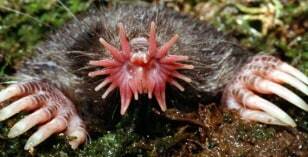 The fleshy appendages that ring the snout of the star-nosed mole, shown here, make it one strange-looking creature. But when it comes to eating, those 22 tentacles help the mole detect and devour food faster than the human eye can follow — in a fraction of a second. Researchers say the speedy feeding allows the mole to prey on small insect larvae that would otherwise be too energetically costly to eat. The creature lives and forages under the cover of marshes and wetlands along the east coast of North America. 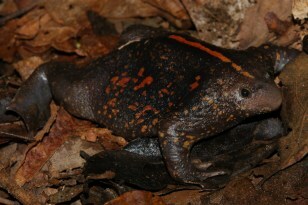 For an amphibian, the stocky and squat Mexican burrowing toad doesn't look all that strange, but it's actually unique. A global conservation program called EDGE of Existence ranks the toad as the most "evolutionarily distinct" amphibian in the world. A fruit bat, polar bear, killer whale, kangaroo and human are all more closely related to one another than the toad is to any other species, according to the program. The Mexican burrowing toad, as its name suggests, spends most of the year underground, coming out only after particularly heavy rains to breed in pools of water. Named after the legendary shaggy man-beast that tromps through the snows in some of the world's tallest mountains, the Yeti crab blindly scurries about hydrothermal vents along a ridge at the bottom of the Pacific Ocean. 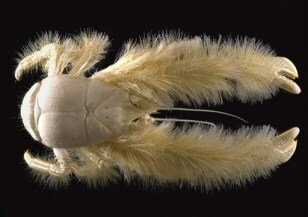 First observed in 2005, the crab, officially named Kiwa hirsute, sports a carpet of pale yellow hairs on its arms. Scientists suspect the crab uses those hairs either to farm bacteria or to feel its way around the seafloor for food and potential mates. 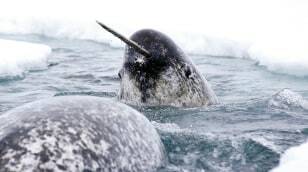 Unicorns are purely mythical creatures, but the myths may have been inspired by narwhals. Most males and some females among the 2,200- to 3,500-pound whales sport an 8-foot-long appendage that emerges from the left side of their upper jaw. Scientists recently discovered that the elongated tooth is packed with nerve endings, making it extraordinarily sensitive. The whales may use it to determine the salinity of water and search for food. Male narwhals are also known to rub their tusks together, presumably because it gives off a unique sensation. In January 2007, scientists announced the discovery of a new species of bat that uses suckers on its thumbs and hind feet to stick to broad-leafed plants such as the traveler's palm. 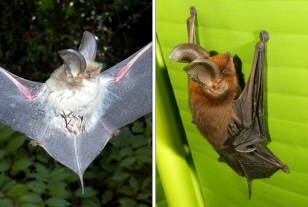 The new species, Myzopoda schliemanni (left image), was found on the dry, western side of the African island nation of Madagascar and is closely related to another sucker-footed bat called Myzopoda aurita (right image) that lives in the humid eastern forests. Conservationists were heartened by the discovery because it suggests the bats can adapt to pioneering broad-leafed plants in deforested areas. Only about 8 percent of the island's original forest cover remains. Watch NBC video: What's killing all the bats? 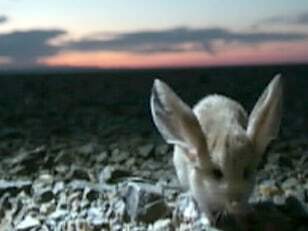 In December 2007, conservationists released the first known footage of an endangered rodent they've nicknamed the "Mickey Mouse of the Desert." Known more formally as the long-eared jerboa, the little critter has ears about one-third larger than its head, and legs that allow for hopping like a kangaroo. The International Union for Conservation of Nature lists the species as endangered. One threat: the domestic cat. Every now and again, trysts between two different species result in oddball offspring that capture the public's fascination. 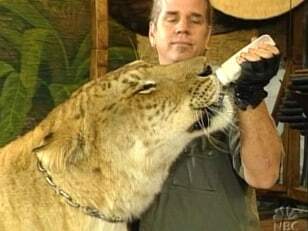 Ligers, which are a cross between a male lion and a female tiger, were immortalized in the 2004 cult movie "Napoleon Dynamite": The main character of the 2004 cult movie, played by Jon Heder, describes it as "pretty much my favorite animal." (A real one is shown above.) Other popular hybrids include wholphins, which are a cross between false killer whales and Atlantic bottlenose dolphins; and the "grolar bear," a cross between a grizzly bear and polar bear.